Braun’s most effective epilator yet, the Silk-épil 9 is the perfect gift for your loved one; your mother, sister, daughter or friend. 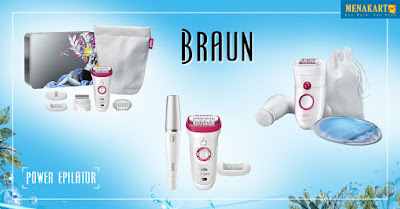 This special limited edition Braun Silk-épil 9 9-567 is packaged in a beautiful gift box, so half the job of gifting is already done for you. Bundled with a beauty pouch, she can enjoy beautiful, smooth legs anywhere and anytime. REMOVES MORE HAIR IN ONE STROKE FOR UP TO 4 WEEKS OF SMOOTH SKIN. The 40% wider head ensures even more hairs are captured and removed in one stroke, while the revolutionary MicroGrip Tweezer Technology with wider, longer and deeper tweezers increases epilation performance – removing hair 4x shorter than wax. Works in the bath or shower for a more comfortable epilation. Moreover, epilation is virtually painless with regular use. Pulsating active vibrations for an extra gentle sensation. The pivoting head smoothly adapts to body contours for superior comfort and efficiency. Epilation gives you instantly smooth skin that lasts up to 4 weeks. Braun Silk-épil epilators remove 4x shorter hair than wax (0.5mm). Silk-epilators feature a massage attachment that helps to reduce discomfort. When done regularly, epilation becomes virtually painless. Epilation helps hair grow back lighter and less noticeable. It’s not just for legs – the different attachments are designed for use on underarms, arms, face and bikini area. It’s great for sensitive skin because it doesn’t pull the skin when removing the hair. Epilation is a suitable hair removal method for all women and all skin types.